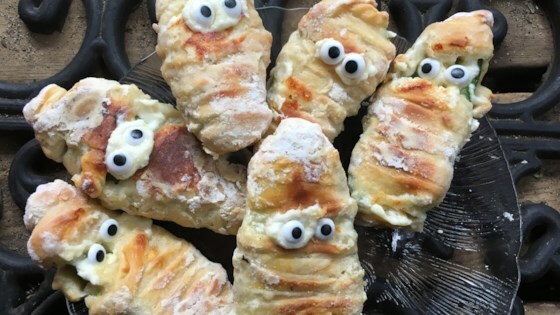 "These baked Halloween jalapeno popper mummies are easy to make and taste delicious." Combine cream cheese and Cheddar cheese in a bowl and season filling with salt and pepper. Spoon filling into jalapeno halves. Roll out crescent dough on a lightly floured surface and cut into thin strips using a pizza cutter or a small knife. Wrap stuffed jalapenos with dough strips, leaving a small space unwrapped where the eyes will go. Combine egg and milk in a bowl. Add flour to another bowl and season with salt and pepper. Dip stuffed jalapenos first in the egg mixture, then roll in the flour. Place on the prepared baking sheet. Bake in the preheated oven until dough is lightly browned, 15 to 20 minutes. Remove from baking sheet and stick candy eyeballs in melted cheese. If you like, you can also deep-fry them but I prefer them baked. Excellent - great for the grups attending the Halloween festivities. they came out so cute and tasted DELICIOUS! A little bland and didn’t have much heat. It was enjoyed by my guests and was a creative appetizer.